Wood Timbers — Createk Inc. In addition to creating the most realistic artificial “living” trees and plants, Createk produces the most convincing deadwood in the industry. 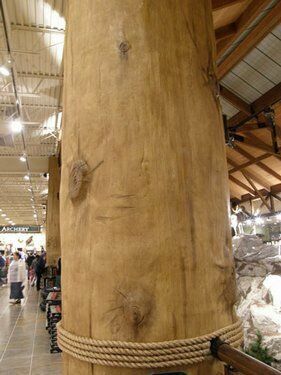 Our creative artists take great pride in the thousands of artificial stumps, logs, branches, and petrified wood pieces created for our customers. Perhaps you’re in need of intertwined branches for a beaver dam exhibit, giant burned logs for a showcase on forest fires, or even an underwater sunken rowboat. The possibilities are endless with Createk! Createk material can be molded and sculpted to replicate natural objects in any setting. Wood timbers can have a smooth feel with little to no undulation or we can match (to near perfection) the smallest details found in nature such as tree bark (shown below).